In this article, we consider the problem of finding in three dimensions a minimum volume axis-parallel box into which a given set of unit size disks can be packed under translations. The problem is neither known to be NP-hard nor to be in NP. 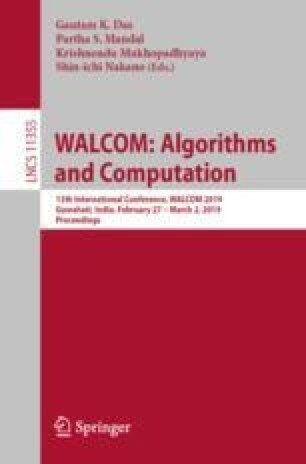 We give a constant factor approximation algorithm based on reduction to finding a shortest Hamiltonian path in a weighted graph. As a byproduct, we can show that there is no finite size container into which all unit disks can be packed simultaneously. N. Scharf was partially supported by a fellowship within the FITweltweit program and H. Alt by the Johann-Gottfried-Herder program, both of the German Academic Exchange Service (DAAD). J. Park was supported in part by starlab project (IITP-2015-0-00199) and NRF-2017M3C4A7066317.